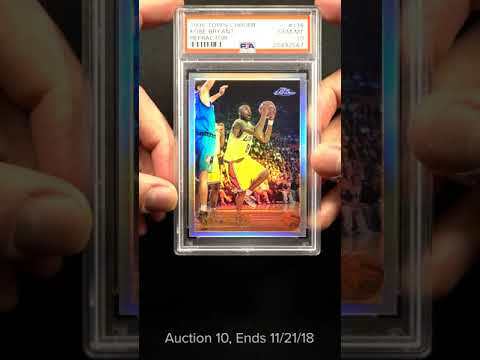 **Auction 10, Round 2** Incredible card! Presented here is among the single most important modern rookie card in the hobby and seldom seen on the public auction block. Few products incapsulate the '90s in collecting better than the '96 Topps Chrome Refractor production. By no means an easy card to locate in such high-grade which is condition sensitive surfaces which are notorious for refractor lines and surfaces scratching. The offered Kobe rookie card is just mesmerizing with glistening surfaces that boast eloquent color and clear imagery. Perfectly framed with blemish free borders and chip less edges around. Displays uncirculated corners to boot! This card is really as good as it can possibly get. Kobe Bryant rookies continue to soar in value as investors realize just how special this man was to Basketball with the stats and championships to back up the status of among 'the best of all-time'. A blue-chip commodity which is deserving of the finest portfolio. Enjoy! One of over 16,000 cards, lots and sets up for bid in our 10th Auction of 2018. Click on the link above to view the other PWCC auction lots.